Special 2-2 is the second level of Special 2 in Super Mario 3D Land. It is based off World 3-2. The player starts out on a beach right in front of the water with a + Clock in the water. Underwater, are two more + Clocks and two Bloopers right next to the Warp Pipe. The player will exit the Warp Pipe on another beach area and can can either go underwater immediately or jump onto a platform which has a thorny flower before going underwater again. Progressing through the water the player will find an abyss with more water to the right of it, progressing through this will leads to a Rubber Platform which leads to the surface, albeit momentarily. 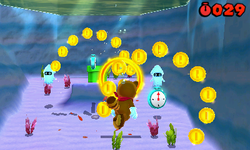 The next underwater area contains several Bloopers and a Spike Eel. After progressing through that area, the player will use another Rubber Platform to surface again and then they will enter the Warp Pipe that leads to the final area. The final area has a bridge that leads straight to the Goal Pole. Star Medal 1: The Star Medal is in plain sight, in the corner next to the first underwater rectangular ? Block. Star Medal 2: The second Star Medal is right above a Rubber Platform. Star Medal 3: The third Star Medal is near the end of the level, on top of a pair of Wooden Blocks stacked on top of each other.